LNB (Low Noise Block Converter) with input frequency in the band 10-12 GHz completed with adjustable illuminator is designed for radio astronomy applications where high sensitivity and stability are required. The unit, built in a sturdy aluminum insulated frame, is thermally stabilized with an internal regulator that powers a heater: the internal temperature (around 47 ° C) is kept constant and the effects of external temperature variations are minimized. A dedicated power cable supplies the stabilization circuit (12-22 V). The best performance is obtained when the stabilization circuit is fed at a voltage close to 20 V and when the outdoor temperature hikes are kept below the internal temperature. Thermostat control does not work when the outside temperature is very high, such as in the central days of summer at low latitudes, or when the antenna is oriented toward the sun (excessive solar radiation heating). The current absorbed by the heater is about 1.5 A when it is powered at 12 V, about 3 A when it is powered at 22 V.
The device is equipped with a corrugated illuminator for circular parabolic reflector antennas, to be installed on the focus of the antenna: through a TV-SAT coaxial cable, it can be connected to all the receivers of RAL10 line. The illuminator is designed for circular parabolic reflector antennas (prime focus) and can be adapted to the LNB though a C-120 flange. 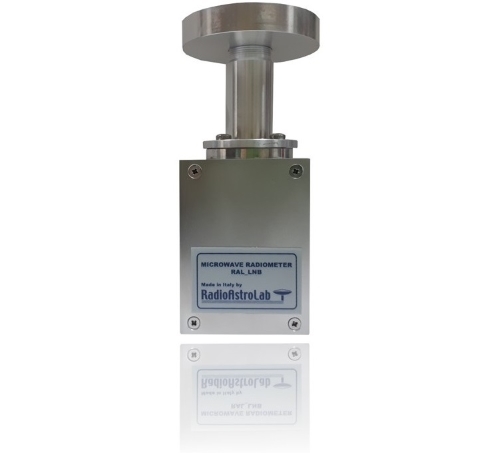 The system works in the universal band 10-12 GHz, and can be used with antennas having a F/D (focal length / diameter) between 0.32 and 0.43: for an optimal operation, the size of the antenna used is not relevant, provided that the given F/D ratio is respected.